The frontier look of the Buck Special dates back to the days when Buck Knives was a two-man shop. This striking bowie pattern evolved from one of the most popular knives made by Hoyt and Al Buck when they built every knife themselves by hand. The blade is a little different now, with a swept clip point design and an elegant hollow ground edge, but the quality still shows. The good looks come from the handle as much as the blade. 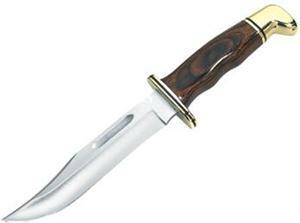 The knife's built with a polished brass bolster and pommel and solid Central American cocobolo hardwood handle. The rat tail tang is fully concealed, and the seamless construction fits the grip perfectly to the blade. Fingers stay in the subtle notches behind the generous hand guard even in slippery conditions. The 6-inch high carbon 420HC stainless steel blade has a full length plain edge, easily sharpened and capable of any work you'd expect from a serrated knife. The heavy duty Buck Special hunting knife comes with a brown leather sheath that matches the quality of the blade -- the streamlined design includes a locking strap that snaps securely around the knife handle. At 10.5 ounces, the Special won't weigh you down on the trail and will handle any job you need done. A knife of this size fits the gear of hunters more than backpackers -- if you're wearing a pack with a load-bearing hip belt, the knife sheath will be a little awkward. When you're hauling that kind of load, the Special carries better in a pack pocket than on the belt.